Boys really like Star Wars but it can be hard to find the perfect Star Wars gifts for boys 6 – 9 years old. They are growing up a bit and it can be hard to find the right gift. But remember that they still like books, toys and other fun Star Wars stuff. We picked through a bunch of selections and came up with this list of the very best gift ideas for boys of this age. Your Star Wars fan is going to go crazy for these. The Star Wars Mad Libs edition is a great choice if you want to slip in a bit of learning or if you want to get them laughing. We are big Mad Libs fans in our household. This one has stories from 6 Star Wars movies. This drawing book is a great idea. Star Wars Doodle Book is just that – doodles, which is really nice as it doesn’t go so much into detail that boys are overwhelmed and yet it helps them turn out some nice looking drawings. Star Wars Origami consists of 36 paper-folding projects (from a galaxy far, far away, of course!) For a detailed review go here. The paper is specially printed to make the projects look very cool. With the new movie, came a new DK book, and it is hot right now. Star Wars: The Force Awakens Visual Dictionary is packed with information about the new movie. You know DK does books right! See more Star Wars books here. The Best Star Wars Toys for Boys! Did you know they made these? I had no idea. It is a Force Awakens Nerf Gun. It only comes with 3 Star Wars darts (3 – really?) but you can use regular darts or purchase more. Seriously? Furbacca lol Oh how fun is this? You can even play virtual activities with this toy if you get the app. Crayola Star Wars Light Up Tracing Pad lets your boy trace some really great images. I am a fan of tracing because it helps kids learn how to use their drawing tools make specific lines. I am always amazed at what my son draws after spending some time tracing. This unit lights up and can be used as a light box as well. This model of a First Order Special Forces Tie Fighter requires no glue, paint or tools. It is totally snap together. It includes batteries as it lights up and makes battle action sounds. Cool! Make Obi-Wan Kenobi or other Star Wars characters with this Bionicle-like LEGO set. These are really popular among boys I know. You know I have to add LEGO, right? 🙂 Try this one! First Order Snowspeeder is a great build with 3 minifigs. We also really like the LEGO Star Wars Flash Speeder set. You can’t go wrong with a Star Wars Clone Trooper bank. Get a Star Wars clock or a LEGO Star Wars watch for boys (like this one) to help them keep track of the time. Last, but not least, if you are looking for Star Wars shirts for boys try this totally cool Star Wars Glow in the Dark t-shirt. Or go here to see all of the Star Wars shirt selections. 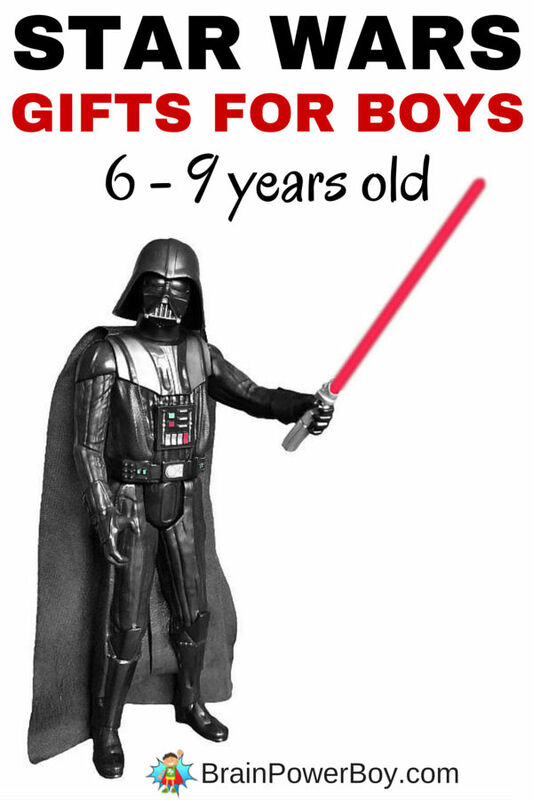 I hope you find the perfect Star Wars gifts for boys 6 – 9 years old on this list. Keep in mind that we have other Star Wars gift lists as well so be sure to check those to see if there is something else your boy might enjoy. There is definitely cross-over between ages and ideas from the other list may fit your 6, 7, 8 or 9 year old boy just right.